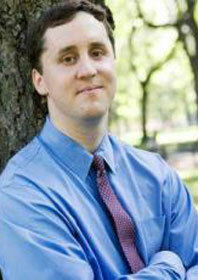 Keith Berman is a certified educational planner and president of Options for College in New York City. He has six years of experience as a college counselor. Keith holds a B.A. from Yale, an M.S.Ed. from Bank Street College of Education, and an Ed.M. from Harvard. He is a member of AICEP, IECA, and NACAC. The biggest challenge our students face is not knowing what college is. For all the talk of "college preparatory high schools," I have yet to meet a student who knows what a department, advisor, major, elective, and registrar is. Our students are usually fascinated to actually learn how their hopes and dreams can be served by colleges--I'm continually stunned how often a student artist chooses a communications degree or how often students blandly say "math" as their future major without being able to name a mathematician. It is epidemic that social fit is the only factor discussed; real teenagers are smarter than they are getting credit for. Before we match students to schools, we walk them through the types of courses at a college, what a major is, what a faculty/department is, how to connect with them, and much more. We also make sure that students choose schools for better reasons than the most typical one, that someone they love or respect goes to a school. We move from "red factors" like "where your friends went" and "student-faculty ratio" to "green factors" like "cocurricular opportunities" and "academic program." To get into and get the most out of college. When our students come back as college juniors and are lighting up their college academically while having a life-changing experience, we feel we've achieved what we were after. Out students do remarkably in the admission process, so we have always asked ourselves, "Since they are getting in, what next?" Be ready to model everything--teenagers are looking for role models so they can have new ways to think about who they are and could be. Know how to write, be willing to write an essay of your own just to show students it is possible, know your grammar, understand narrative. Do community service yourself, and do it in a high-impact way. I run networking events for young educators and online discussion groups regularly and volunteer for two of my alma maters. The oddest one, I think, is that some students feel the SAT/ACT is meaningless simply because it is flawed. I even see professionals mistaking the idea of statistical bias for prejudice. I cringe to think what would happen in the absence of some universal measuring stick for achievement. Equity is dependent on giving students opportunity, and the SAT/ACT set some standard at least (much more so than the essay, recommendations, counselor advocacy, and the much more subjective, socioeconomically unequal parts of the application process). I do not experience these differences that much. I always say to parents that your son/daughter can figure out what you are thinking even when you are not saying it aloud--students usually consider these perspectives long before they take off for college. It is an unofficial motto around here to "never underestimate a 16/17/18 year old." Have you seen students successfully use social media (Facebook, Twitter, YouTube, etc.) as a tool in the college admission process? How do you advise students to edit their online presence? No, never. I advise students to temporarily suspend these accounts. As an early Facebook user and frequent presenter on technology topics, I know as well as anyone that they are far, far more likely to be considered "lame" by an admission officer than anything else. I know admission people who feel even having an account at all is a sign of a poor applicant. Advise them to get tutoring or preparation of some sort. We give our families a range of options and let them choose, but we emphasize that preparation does make a difference--the research is simply there. For individuals, it is referral. For organizations, we develop resources such as an HEOP/EOP book and call about 100 financial aid officers each year. Anecdotes, outlines, standard written English. If you can't read it aloud without grimacing, it's not ready. Ultimately, our students' essays are so different from each other because the students themselves are--it's hard to give a small piece of advice. We have surveys, résumés, and interviews for data. We ultimately use decision-making analysis. Unlike many peers, if a student wants to take a chance, we simply tell them their chances; we don't prevent it. That's why families come back to us, I think, because we don't create fences around students' hopes and aspirations--we just encourage them to have a sense of humor and stick to Plan A.
Adhere to the standard of accomplishment by the standard of the real world. It is cool to start a charity, to be on a radio show, to exhibit at a gallery, to be published in history, science, etc., to attend conferences. In a few weeks, two former advisees (both currently in college) are returning to discuss their professional and academic accomplishments before they even graduate. Any time old students come back to say, "Wow, college was so much more than just fun," we've done our job. Favorite book: Language and Mind, Crime and Punishment, Black Hawk Down, The Aeneid, or Banker to the Poor--those were the first ones that came to mind. Favorite band or musician: J.S. Bach, The Temptations, Tribe Called Quest, Elton John--impossible question . . . Your personal motto: 85% of students are happy in college. There are no parents, you stay in Spartan dorms, eat lousy food, and largely have the time of your life. The sublime match comes when you can make use of the time before 8:00 p.m. as much as the time after.